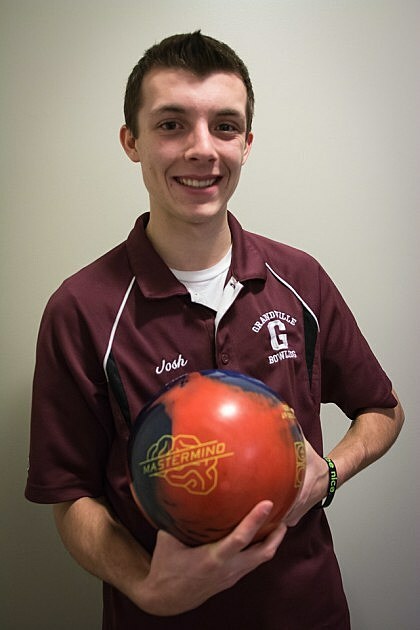 Josh Kukla, who leads Grandville High School boys’ bowling squad and is the defending MHSAA Division I singles champion, is this week’s Meijer-97.9 WGRD High School Athlete of the Week. 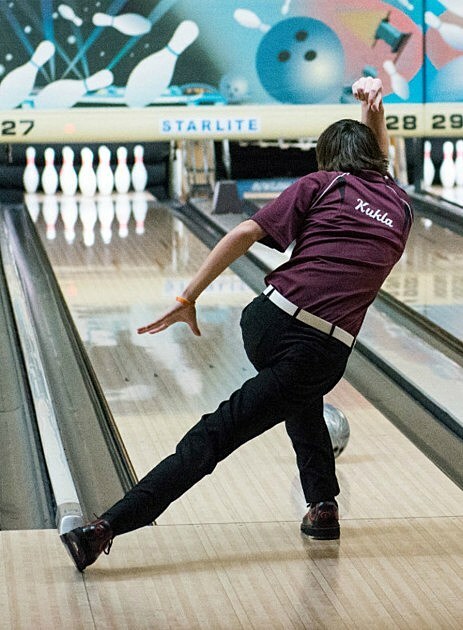 Kukla is in his third year on the Grandville varsity squad, and is averaging about 221 pins per game through Wednesday’s match with Hudsonville — a 21-9 Bulldogs win behind his 246 and 234 games — at Spectrum Lanes in Wyoming. He rolled a 692 three-game series in the Ottawa-Kent Conference Red Division pre-conference tournament on Jan. 4 at Spectrum, tying for top honors with East Kentwood’s Anthony Deans. “When he started his freshman year, he was probably one of the worst bowlers I’ve ever coached at high school,” Grandville Coach Mike Eaton said of Kukla. “But he worked very hard his sophomore year, … and toward the end of his sophomore year it started kicking in. Kukla concurs with such assessments, saying he’s more about placement while still working on his rotations (or revs). He bowls with a 15-pounder, having four different types of bowling balls with a Brunswick Mastermind as his favorite. “I don’t really throw too hard; I’m straight up,” he said. Kukla gives credit to Eaton for helping him improve and work on his mechanics. He also credits his grandfather, James Rogers, for getting him involved with bowling as a 10-year-old. He figures he averaged in the 140s his freshman year and in the 160s his sophomore year. Three Grandville bowlers qualified for the MHSAA Division I individual singles state finals competition in 2013, but Kukla wasn’t among that trio as a sophomore. In 2014 as a junior, Kukla took the Division I singles title at the MHSAA state championships. He averaged 237.8 pins for six games in qualifying before winning four two-game matches capped by a 470-384 win over Hudsonville’s Alex Stillwell in the finals at Sunnybrook Lanes in Sterling Heights. In the quarterfinals, he rolled 12 strikes for a perfect 300 first game against Clarkston’s Jacob Kersten, who opened with spare and followed with 11 strikes for a 290. In the second game, Kersten won 215-205. That forced a roll-off, which Kukla won 55-28. Kukla then won his semifinal match over Macomb Dakota’s Justin Taylor 411-409 with games of 188 and 223. The 300 was his second perfect game in 20 days, with his other being at the Ottawa-Kent Conference Red Division post-conference tournament. Meanwhile, Grandville finished 18th in team competition, which was won by Detroit’s University of Detroit Jesuit over Grand Haven. Eaton says Kukla’s work ethic and intelligence have combined to put him where he is on the lanes. In addition, he’s also gained some insight and knowledge from Eaton’s two collegiate bowling sons, Mick, a senior at Lindenwood University in Missouri, and Bryan Eaton, a freshman at Davenport University in Caledonia. That mental toughness and earnestness in developing his game is also evident away from the bowling alley on the tennis court. In the fall, Kukla partnered with junior Josh Troemel on Grandville’s boys’ tennis team at No. 1 doubles for a 25-6 record, capturing the regional and losing in the quarterfinals of the Division 1 Lower Peninsula state championship. In 2013, he and Ryan Niemchick were regional runners-up and lost in the quarterfinals of the Division 1 state finals after winning the Ottawa-Kent Conference Red Division to help lead the Bulldogs to their first outright OK Red title. This season, Grandville is 3-1 in OK Red Division competition to date. Plus, there’s much bowling ahead yet for Kukla and the Bulldogs. The postseason is weeks away, with the regional Feb. 27 and 28 at Starlite Lanes in Grand Haven and the state finals set for March 6 and 7. In the classroom, Kukla carries a 3.6 grade-point average on a 4.0 scale at Grandville High and is in the school’s National Honor Society chapter. In addition, he volunteers with third- and fourth-graders at Mars Hill Bible Church in Grandville. The oldest of Cheryl and Greg Kukla’s three children, his brother, Kyle, is on Grandville’s bowling team with him. He plans to major in accounting in college, but says he is still determining where he might attend and compete. Congrats Josh from Meijer and WGRD as well as Channel 95.7, 100.5 The River, 98.7 WFGR and 1410 AM The Touch.